0603F0 6" 3-Jaw Plain Back Scroll Lathe Chuck . 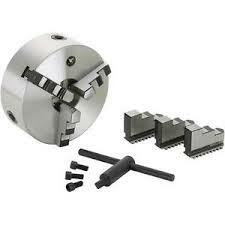 This 3 -jaw self centering chuck features semi-steel body with plain back. Includes two sets of jaws ,a wrench and mounting screws. Requires a mounting plate. For those of you who are not familiar with the chuck mounting. "plain back" means that a backing plate is required to mount the chuck to your lathe. Since their are so many different types of spindles on lathes,you would require a back plate that fits your lathe spindle and then mount the chuck to the plate. The mounting bolts go thru the back of the plate into the back of the chuck, usually on the edge of the chuck since there is a scroll mechanism for self-centering jaws.